The volition in applying new materials always more technological, according with the customer’s requests, is pushing our industrial reality out to introduce the processing of a new material, Ethylene vinyl acetate or commonly known as EVA. 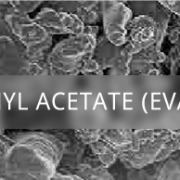 Ethylene vinyl acetate (EVA) is the copolymer of ethylene and vinyl acetate. It’s an extremely elastic material that can be sintered to form a porous material similar to rubber, yet with excellent toughness. It is three times as flexible as low-density polyethylene (LDPE), showing tensile elongation of 750% with a peak melting temperature of 250°F (96°C). This material has good barrier properties, low-temperature toughness, stress-crack resistance, hot-melt adhesive waterproof properties, and resistance to ultraviolet radiation. EVA has little or no odor and is competitive with rubber and vinyl products in many electrical applications.